New Zealand has released it's post 2020 climate targets, but already they are being heavily criticised by civil society and scientists as far too low, even given the specific national circumstances of the high proportion of agricultural sector emissions in the nation's greenhouse gas inventory. The New Zealand INDC (PDF) was submitted to the United Nations on Tuesday 7 July 2015. The primary post 2020 target is set at 30 percent below 2005 levels by 2030 (which equates to 11 percent below 1990 levels). New Zealand also has a longer term target of reducing emissions to 50 percent below 1990 levels by 2050. While 80 percent of it's electricity is already produced from renewables, it has pledged to increase this to 90 percent by 2025. Minister: "significant increase on our current target"
Groser highlighted that 80 percent of New Zealand's energy already came from renewable sources, with a high proportion of emissions from the agriculture and transport sectors, "So there are fewer opportunities for New Zealand to reduce its emissions right now." he said. In essence Grosser outlined a policy of kicking the can down the road and heavy reliance on carbon trading credits, "Our investment in agricultural research is beginning to bear fruit and the cost of electric and plug-in hybrid vehicles continues to fall. I think in 5-10 years we’ll be in a good position to reduce our emissions in both agriculture and transport." he said. Tim Groser acknowledged the large number of people who engaged in public meetings and the more than 15,000 formal submissions made on what New Zealand's post 2020 targets should be, but not what most of those submissions called for: ambituous post 2020 targets in accordance with the science. Professor Ralph Sims (see comment further down) highlighted that "68.7% of the submissions of around 16,000 people to the climate change consultation document sought 40% or more reduction in emissions below 1990 levels." New Zealand also made their UN INDC pledge highly conditional on accounting for the land sector, and confirmation of access to carbon markets. 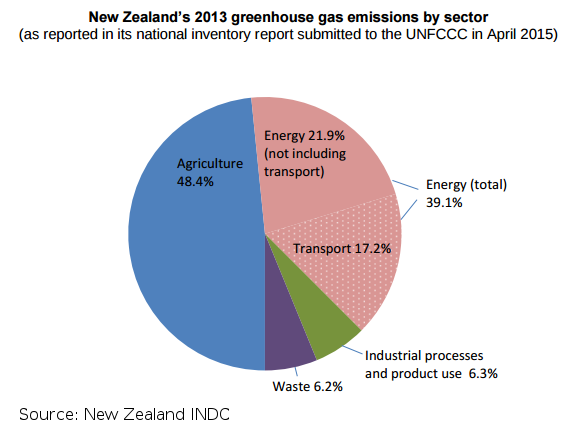 New Zealand Government argues that there are specific national circumstances why it cannot increase emissions reduction. These include a higher than average population growth: 31 percent, as against OECD average of 18 percent. Also the Agricultural sector produces nearly half (48 per cent) of the national emissions, whereas the OECD average is 9 percent. While most nations can cut emissions through expansion of renewables in the electricity sector, New Zealand already produces 80 percent of electricity from renewables, whereas the OECD total average is 21.9 percent. “Oxfam is enormously disappointed with New Zealand’s emissions reduction target. The target of 11% emissions reduction below 1990 levels (30% below 2005 levels) by 2030 reflects a worrying lack of ambition. This target does not represent New Zealand’s fair share of the international effort required to keep global temperature rises below 2°C, let alone the 1.5°C that many developing countries are calling for. “New Zealand’s neighbours in the Pacific are some of those most affected by climate change and this target will be a slap in the face to them. It is irresponsible for New Zealand to continue to pollute the atmosphere with dangerous amounts of greenhouse gases whilst also claiming to be a friend to the Pacific and other small island developing states. If all countries adopted a similar level of ambition then the resulting climate change would be devastating to Pacific island countries. Greenpeace New Zealand also issued a statement and said the post 2020 target was a con-job, “On paper it may look ok, but it’s a distraction from the fact that it’s not an improvement on any of our previous targets at all - it’s a con-job,” said Greenpeace NZ Climate Campaigner Simon Boxer. “Those in power who are meant to be representing the best interests of Kiwis can bandy about any figures they like, but guess what - they won’t actually have to stick to them if this plan goes ahead. In his seven years at the helm of our country, John Key has failed to introduce a single piece of law to reduce climate pollution – that’s not going to change.” said Simon Boxer, taking a dig at New Zealand's conservative prime Minister John Key. Commentary from the science community was equally scathing in the low ambition in the target. "The Government’s target errs on the side of the challenges New Zealand faces when deciding on a target. New Zealand is uniquely placed in terms of our agricultural emissions, and our national circumstances, but we are equally uniquely placed to lead on developing low-carbon solutions that support, enhance and potentially advantage our economy. "We need to be more ambitious and match the EU promise to reduce greenhouse gas emissions by 40% by 2030." Dr Adrian Macey, Senior Associate, Institute for Governance and Policy Studies, Victoria University of Wellington, called this a "minimum credible target", and highlighted that New Zealand already has on the table a conditional target of 10 to 20 percent below 1990 by 2020, with an unconditional 5 percent below 1990 by 2020 target. "A reduction of 11% below 1990 by 2030 will not put New Zealand on a pathway to meet the gazetted 50 percent reduction (from 1990) by 2050 target. "New Zealand, along with other countries will face pressure to increase the ambition of its target at and after this year's Paris climate change conference. But the international target is only part of the question. A great deal of work is now needed at home to determine the direction of our climate change policies, including the review of the Emission Trading Scheme." Prof James Renwick, School of Geography, Environment and Earth Sciences, Victoria University of Wellington, said "This is in line with the previous target of 5% by 2020, and 50% by 2050, so there is no “strengthening” of New Zealand’s position. This new target is as weak as previously-announced ones and does not come close to what is required, if New Zealand is serious about keeping warming to less than 2 degrees (as the Government have said we are)." Professor David Frame, Director of the Climate Change Research Institute, Victoria University Wellington called the target "pretty reasonable" and endorsed it's conditionality. "In this sort of problem a country’s best course of action depends on what others are prepared to do, too: if they do more, we can do more at the same price – if Japan drives its motor industry to produce affordable hybrids and electric vehicles, then New Zealand gains additional ability to reduce its emissions in the transport sector. Catherine Leining, Policy Fellow, Motu Economic and Public Policy Research also highlighted gap between policy and what is required, “What’s missing from the submission is a firm commitment backed by policy to decarbonise the New Zealand economy in line with global effort to limit temperature rises below two degrees Celsius." Leining highlighted problems in reliance on carbon trading and forestry emissions, "The submission suggests heavy reliance on carbon markets until technology improvements in agriculture and transport become more widely available sometime after 2030. The submission does not address the significant spike in net forestry emissions projected during the target period. Professor Ralph Sims, the Director of Centre for Energy Research at Massey University highlighted in a graph and commentary how lacking in ambition the New Zealand INDC post 2020 targets actually are. "The original 5% below 1990 by 2020 target equates to around 3 Mt / year reduction in gross emissions if starting mitigation from today, whereas the 11% below 1990 by 2030 (i.e. the stated 30% below 2005 by 2030) is around a 1.3 Mt/year reduction – so it is hardly more ambitious!!! "This figure is based on MfE’s GHG inventory 1990-2013. It assumes the NZ target is based on GROSS emissions (though this is not able to be 100% confirmed even in the Minister’s letter to UNFCCC. “So in essence: Previous target of 5% reduction below 1990 levels (66.7 Mt CO2 equivalent) equates to annual total gross emissions of 63.4 Mt CO2 equivalent in 2020. This new target of 30% reduction below 2005 levels equates to annual gross emissions of around 59.2 Mt CO2 equivalent in 2030. Minister Groser is therefore correct in saying this is similar to a target of 11% reduction below 1990 levels (which would equate to 59.4 Mt CO2-eq ). “BUT we now have 10 years longer to reduce New Zealand’s total GHG emissions by an additional relatively small amount of 4.2 Mt CO2-eq. “The original 5% below 1990 by 2020 target equates to around 3 Mt / year reduction in gross emissions if starting mitigation from today, whereas the 11% below 1990 by 2030 (i.e. the stated 30% below 2005 by 2030) is around a 1.3 Mt/year reduction. “Is this really “doing our fair share” when to meet the internationally agreed target of keeping the temperature rise below 2oC requires around 40% global GHG reductions by 2030? “In fact, from the MfE web site, 68.7% of the submissions of around 16,000 people to the climate change consultation document sought 40% or more reduction in emissions below 1990 levels (including the Royal Society of NZ see). The vast majority of those people will be very disappointed in this low-ambition target – so much for public consultation. Assoc Prof Frank Jotzo, Director of the Centre for Climate Economics & Policy and Director of the Resources Environment and Development (RE&D) program at the Australian National University commented "Most other countries’ pledges imply ramping up their effort in the 2020s, New Zealand’s pledge fails this test." So New Zealand joins Canada and Japan in being a climate laggard in the lead up to the December Paris UN climate talks. Canada set a post 2020 target of 30 percent on 2005 levels by 2030, which is widely seen as an insufficient target which it is unlikely to achieve except by major offsets. According to Climate Action Tracker, Newspaper articles report that Japan will likely put forward an emissions reduction target of 20 percent below 2013 emission levels by 2030. The USA, Europe and China have all submitted more ambituous emissions reduction plans as part of their INDC submissions. Europe has pledged a 40 per cent cut on 1990 levels by 2030, China has pledged a 60 to 65 per cent cut on 2005 levels by 2030, and the United States has pledged a 25 to 28 per cent cut on 2005 levels by 2025. The small island nation of Costa Rica has pledged to be carbon neutral by 2021. However, the combined plans of all nations indicate we are still on target for burning the planet with 3 to 4 degrees C of warming by the end of the century, according to climate scientists presently meeting in Paris. "The world is at a critical crossroads," UN Secretary-General Ban Ki-moon said at the gathering of 2,000 academics. "Clearly strong action still needs to be taken." Climate science from the IPCC has recommended, since at least the Bali climate roadmap in 2007, that industrialised countries need to cut their emissions by 25 to 40 percent below 1990 levels for a reasonable chance of the planet staying under the 2 degrees Celsius threshold and avoid dangerous climate impacts likely to occur above that level. Dutch Citizens recently won a landmark legal case under tort and human rights law with a ruling that the Netherlands Government needs to cut emissions by at least 25 percent by 2020 in accordance with the climate science recommendations. Some Pacific Island nations have already indicated that legal cases may be launched against countries or corporations that are major climate polluters or not sufficiently addressing the need to reduce greenhouse gas emissions.